If your turning job includes the need for large thru-hole turning of bar stock or tubing, Bardons & Oliver has the solution. Our tough, 2-axis big-bore turning machines are domestically built with attention to quality, precision and durability for long-lasting, heavy-duty production. Your large thru-hole job is completed in one fully automated operation to increase production efficiency, reduce waste and save time. The advanced spindle design sets these machines apart from the competition. Powered by high horsepower AC 40-, 54- or 80-HP spindle drives, the 2-axis big-bore turning machines operate using the highest spindle speeds in the industry—up to 3,000 RPM. The advanced engineering includes angular contact ball bearings, polymer composite housing construction, protective closure systems and maintenance-free bearing lubrication. Automatic loading and unloading capabilities further increase production efficiencies. The bar and tube loading systems include automatic magazine loading capable of handling incoming material up to 40 feet long. The part unload and remnant removal systems unload finished parts up to 10, 15, 22 and 32 feet long. 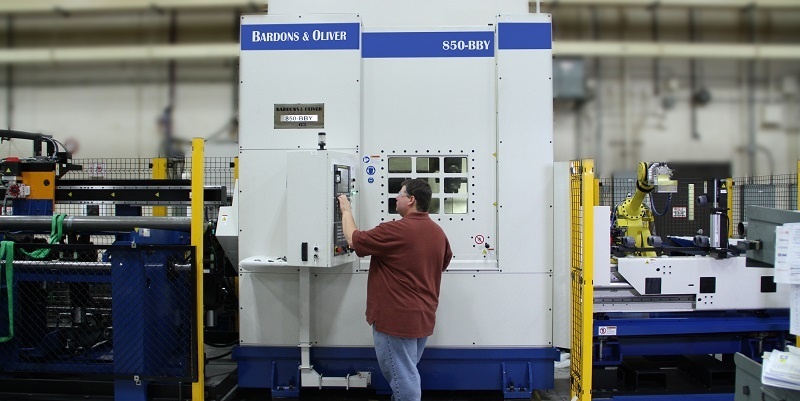 Bardons & Oliver’s industry-leading innovations create solutions. For more than a century, our custom engineered systems have relied on quality, precision and customer service to deliver world-class results.